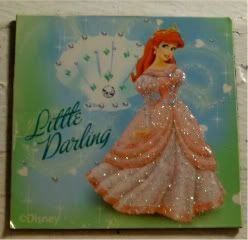 I have to admit, whenever I see this Ariel magnet, that Beatles song, Here Comes the Sun runs through my head. It's on the Parent Trap soundtrack, which is surprisingly one of the best. soundtracks. ever. It's one of my favorite movies, even if it's a little bittersweet watching Natasha Richardson in it. Ariel was named Disney princess with the best hair a couple of weeks ago. I think it was a bit of an unfair competition, given that Snow White is like 73 years old, Cinderella's like 60, and Rapunzel's not even a month old! It's hair from different generations, and therefore shouldn't be judged against each other. Nevertheless, Ariel does have supercute hair, both above and below water. For me, I will admit that I'm superjeal of Rapunzel's hair at the end of the movie. Why all the hair talk? Because I figured while I don't really have an office to go to, that I might as well take this time to grow my hair out and donate it. I try and do this every so often, but I never make it - I get so frustrated with ponytails, hair clips, and barrettes that I just run to the nearest hairdresser and ask her to chop it all off. So, for the past several months, I've been waiting and waiting for my own hair to grow, to get that eight inches. And my hair is growing sooooo slow! Hurrrrrry upppppp! Love that song. Love. And it's one of the few that I actually enjoy playing. As for hair, let me know if how the growing-out thingy works. I have enough hair for 10-12 inches, but it would be so so so so so so so short after that massive cut. I should donate... but I don't want to end up a fuzz ball afterward. Ugh, I'm growing out my hair too and the 8 inches is taking for-freakin'-ever. It IS a happy song, Gin! The hair thing is insane. I really just want to get rid of it, but I saw a Pantene Beautiful Length's poll on Facebook a month or so ago, and it asked why were you growing out your hair. And only 17% said to donate it, so that's why I've kept going.